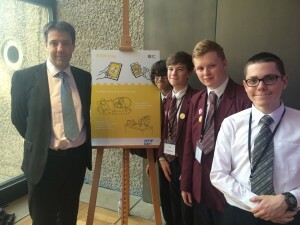 Last week, while Brigid was talking to London Technology Week delegates about Women in Tech, I was out meeting some of the young people who I hope to see working in our digital teams one day, at the Apps for Good Awards 2015. Firstly, can I say what a privilege it was! Apps for Good is a charity that works with schools around the country to bring tech & employability skills to young people. Their annual competition is for student teams to enter ideas for apps that solve real world problems. Along with Capgemini, one of HMRC's suppliers, we recruited volunteers to support regional assessment events, where the finalists were identified for the judging ceremony last week. I'm hugely grateful to those in our organisation that volunteered their time. It's great to see so many people interested in helping others develop their digital skills. In previous years Apps for Good have paid IT professionals to assess the students’ entries, and now the majority of judging is done by volunteers, which frees up money to help more children go through the programme. There are over 20,000 young people on the course at the moment. I am making a personal commitment to encourage my colleagues across other government departments to get involved, so that all the judging is done by volunteers next year. I was part of a panel of 'Dragons' - tech industry leaders and high profile figures judging this year's finalist student apps. Each team pitched their idea to us before we grilled them on their plans. Scary, I'm sure, but they were all brilliant! The teams were looking to solve all sorts of real world problems, from supporting young carers across the UK, to getting unwanted goods to the right cause. I was wowed by the creativity in problem solving I saw, but most of all the confidence and passion that the finalists showed. Charlie Leadbeater, elected Chairman of Apps for Good summed it up at the ceremony "it's all about the young people, such commitment, passion and skill". The team from Sutton Grammar School caught my eye with their entry, STEM City - a whizz-bang-pop science app. Their idea to bring science to life with a bank of experiments, with built-in advice and guidance for parents, really impressed me. I couldn’t help but think of Brigid's session earlier in the week where it was observed that getting young people, especially girls, interested in tech, has to start with cultural change in schools. I managed to catch the team for a photo before I was bumped in favour of selfies with a certain Apprentice winner - fame hey! I left the awards ceremony with the words of the charity's Founding Chairman, Rodrigo Baggio, echoing in my mind. He said: "We are inspiring changemakers". I'd encourage anyone to get involved with this great charity and volunteer your time to support next year's assessment events. Despite not winning, we still want to make our app idea a reality, so please contact us at our realstemcity gmail account if you have an advice or tips on what we should do.